Compound butters are so remarkably simple to make, you almost want to tap yourself on the head and say, "Why didn't I think of that?" Of course, you can make your own butter first, then add the other ingredients, but regular store-bought butter which you've allowed to sit out and soften works just as well. Basically, you add whatever herbs and seasonings you'd like to the softened butter and mix well (Basil Lime Buttah, anyone? Excellent over grilled corn on the cob!). In this case, Aarti Sequeira..you know her, she's that excellent new chef they have over there at the Food Network..well, Aarti takes an ordinary piece of chicken and elevates it to another level with her I Ain't Chicken Chicken recipe. Fresh orange zest and freshly grated ginger, along with flowery cardamom spice infuse this extremely moist chicken with its flavor. To make compound butter - in small bowl place butter, cardamom, orange zest, and grated ginger and mix well. Then add salt and pepper to taste. (Next time I make this I will also add freshly minced garlic.) Set aside. Line a baking sheet with foil and place a cooling rack on top of that. Generously salt and pepper chicken breasts on both sides. On the skin side make a pocket between the skin and the flesh. Place butter in pocket, close and massage to distribute butter evenly under skin. Place chicken skin side up on rack fitted inside baking sheet and drizzle with olive oil. Place pan on grill, close lid and cook for approximately 18-25 minutes or until internal temperature reaches 160 degrees, or juices run clear. Remove from grill and allow to rest a few minutes before serving. Note: Butter will drip down and when it makes contact with your very hot pan, there will inevitably be splatter and smoke. If I were going to make this in my oven next time, I would use a roasting pan fitted with a rack and still line the roasting pan with foil for easier clean-up. The deeper roasting pan should help prevent over-splatter. This salad is another Aarti Sequeira masterpiece. She calls it The Ugly Duckling Salad because of the celery root component which is sort of the "ugly duckling" of the vegetable world. It's gnarly and unattractive on the outside, but inside lies a beautiful, creamy and healthy vegetable. 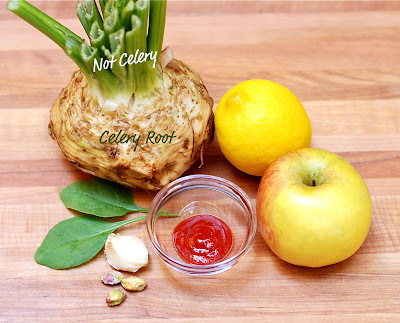 I've long been a fan of celery root, which is what first attracted me to this recipe. Celery root makes a great potato substitute because it has a much lower glycemic index, and it's much lower in carbs and calories - steam it and make mashed "potatoes", thinly slice it to make a "potato" gratin, and the list goes on. For some reason, I hadn't tried it raw, though. I discovered it's delicious raw - mild in flavor and it added an almost creamy texture to the salad. Incidentally, "celery" is not the same thing as "celery root". They are related but not the same. Celery root is a separate vegetable and is grown solely for its root ball. Ok, let's talk about this dressing for a minute. This stuff is so good, I could drink it. It's creamy, citrusy, garlicky and most importantly, pistachio-y. Baby spinach has never tasted so good to me as it did in this salad. The dressing almost reminded me of a Caesar dressing infused with pistachio, only there's no parmesan, egg, or anchovy in this dressing. Regardless, it's delicious! In skillet over medium heat, toast pistachios until lightly browned. In blender or food processor, place toasted pistachios, garlic, lemon juice, Sriracha sauce, water, and oil, then blend till smooth. Add salt and pepper to taste. If too watery, add more canola oil and blend to emulsify. Add drizzle of extra-virgin olive oil and blend once more. Set aside. In large bowl, place spinach and apple slices. To prepare celery root, wash thoroughly, then cut outer peel away from bulb revealing white inside. at the top cut the peel down and away from the root ball. Next grate celery root using a box grater. To prevent from turning brown you can squeeze a little lemon juice on the grated celery root. Add celery root to bowl with the spinach and apple, then add enough dressing to coat. Toss to mix. Note: I had quite a bit of extra dressing left over, but I refrigerated it and will use it on another salad in the next day or two. Savory and delicious! Fresh spinach, feta cheese and my very favorite lesser-known ingredient...the peppadew. Wow, do I love those little guys. They're mildly sweet but also have just a tad bit of heat to them. They're great stuffed with blue cheese and eaten as an appetizer, and I always add them to my pasta sauces (see my Italian Chicken Cutlet recipe). Whatever the dish, you may be assured they will kick up the flavor. I usually buy them in the olive bar at my local market, but I've also gotten them in the jarred olives section. I found this amazing recipe in the September 2010 issue of Bon Appetit magazine. They adapted it from a game lodge located in Kruger National Park in South Africa called Singita Sweni Lodge. I'm so glad they shared it because this will become a regular menu item in my home. In addition to being completely yummy, they're easy to freeze and take with you for lunch, or on the go. When making this dish, I recommend using fresh spinach (not frozen). I found this hearty, organic variety at Bristol Farms but the kind you get in the salad area of the market, pre-washed and in a bag will work fine, too. Also, I used a Pampered Chef 12-cup Stoneware Muffin Pan, which I totally love, but of course you can use any muffin pan you'd like. I've had really good luck with this stoneware pan as it cooks evenly and the sides of the muffins don't over-brown. In my stoneware pan and about to go in the oven. This dish is all about the pistachios. If you like them, you'll love this. Center cut pork loin chops crusted in chopped pistachios and crushed blue corn tortilla chips, pan fried and finished with pistachio oil - Mmmmm! Place flour in a shallow bowl, then place egg wash (beaten egg with water) in a separate shallow bowl. Salt and pepper pork chops then dredge each in flour, then egg wash, then flour again. On one side of pork chops press crushed tortilla chips and chopped pistachios. Heat grapeseed or canola oil in skillet to medium, then place pork chops crusted side down into hot pan. Cook for about 3-4 minutes, then flip and cook for another 3-4 minutes or until pork chops are no longer pink inside. Remove from pan and drizzle with pistachio oil (or extra-virgin olive oil) before serving. The pistachio oil gave it that extra punch of pistachio but these chops would be just as good using extra-virgin olive oil if you don't have, or don't want to invest in, pistachio oil. I picked up this La Tourangelle Pistachio Oil at Bristol Farms and it is really, really good (but expensive). In this case, I felt it was worth it because I'll use it over and over again in salad dressings, as a dipping oil, drizzled over pasta, etc. Some oils are not very flavorful, however, this 100% pure pistachio oil was the exception. Close your eyes, taste, and it's like you're eating a pistachio. I love this blueberry crumb cake. It's not too sweet, plus it's moist, delicious and bursting with blueberry goodness. And, well, anything with crumble on top has to be good, right? I'm a big fan of Ina Garten's so when I was at the farmer's market this past weekend and realized that it would be the last time this season to pick up fresh, wild blueberries - I immediately thought, "I've got to make Ina's Blueberry Crumb Cake" and picked some up. This crumb cake is excellent with a freshly brewed cup of coffee in the morning, or equally wonderful as a dessert - perhaps with a dollop of freshly whipped vanilla or lemon-scented cream. Combine sugar, brown sugar, cinnamon and nutmeg in a bowl. Stir in melted butter and then flour. Mix until it becomes a crumbly texture, then set aside. Cream butter and sugar together using electric mixer with paddle attachment (or hand mixer) on high speed. Reduce speed to low and add eggs one at a time. Then add vanilla, lemon zest, and sour cream. of the flour to help prevent sinking. In separate bowl, sift together flour, baking powder, baking soda, and salt. With mixer on low speed add flour mixture to batter until just combined - do not overmix. With spatula, gently fold in the blueberries and stir until evenly spread throughout the batter. Spoon batter into prepared pan and spread out evenly. Place the crumble mixture evenly over the batter and bake for 40-45 minutes, or until a toothpick inserted in center comes out clean. Cool on rack and then remove from pan and dust top with confectioners sugar. Excellent served warm, too. Baking Tip: Baking is a science and ingredients must be measured carefully. The most accurate way to measure is by weight. I'm particularly careful with flour because the weight has a tendency to fluctuate based on how compacted it is. If you don't have a scale that measures by weight and converts to quantity measurements, just use this method - fluff the flour with a spoon, then drop spoonfulls into your measuring cup until it's over-filled and using the straight edge of a knife or spatula level the top, being careful not to compact it. This will usually get you very close. Also, if you're having trouble with your baking, be sure to invest in an inexpensive oven temperature guage. Chances are it's not your baking expertise, but rather fluctuations in the temperature of your oven. Some ovens have hot spots, and others can be a few degrees off. With baking it all matters. Okay, now it's just getting embarrassing. I mean first it's the Friday Shrimp and it's the best shrimp I've ever had. Then it's the Sloppy Bombay Joes and they're insanely good. Now it's this amazing - yes, that's right AMAZING - kale salad. I just can't help myself. When I try something new and it works and it's fantastic, I just want to shout it from the rooftops. So here I go again - Aarti Sequeira's recipes rock and this one is no exception! Kale is loaded with nutrients and really good for you, and in this salad you get to eat it in its raw state (healthiest) and really enjoy the taste. Sometimes kale can be bitter but with Aarti's technique and additions, I promise you - you will become a kale fan, if not already. I use my husband as a barometer and he has said for years that he didn't like kale, nor mangos. This dish has both kale and mangos and he devoured it. The firm kale seemed to make the mango almost taste creamy, and draped in the citrusy but lightly sweet dressing it was only enhanced further by the crispy, toasted pepitas. See Aarti's recipe here: Massaged Kale Salad and below is how I made it. In large bowl, place kale, half the fresh squeezed lemon juice, a drizzle of oil, and a couple of pinches of kosher salt. Massage the kale with your hands until it starts to soften and slightly wilt. With the kale I used, this happened almost immediately, but it could take 2-3 minutes. Set aside. In small bowl, whisk remaining lemon juice, honey and lots of freshly cracked black pepper. Then stream in the oil while whisking until it starts to emulsify and look like a dressing. Pour dressing over kale, add mango and pepitas, toss and serve. Btw, this salad holds up well even after adding the dressing. The kale holds its shape and doesn't get soggy even when sitting for quite some time. Cook's Note: To toast the pepitas, just place in a skillet over medium heat and lightly toast on each side, about 1-2 minutes per side. Wow - where do I start? Finger-lickin' good?! Can't stop at just one?! All true and then some when it comes to these Sloppy Joes. I honestly was not sure what to expect. I was born and raised in the south and Sloppy Joes were a regular in our household. So imagine what I must've been thinking when I saw pistachios?? and raisins? ?, not to mention honey? and cream? in the recipe. Let me just say, I shall never question Aarti again and the next time I make these Sloppy Bombay Joes and there WILL be a next time - I'll double down on the the pistachios and raisins! It's hard to describe the complexity to the dish they added, but they did. Imagine good old-fashioned Sloppy Joes but with something special that you can't quite put your finger on. Maybe it's the garam masala? The toasted cumin seeds? The creamy tomato sauce? Somehow it just all plays nicely together. I made some minor tweaks to Aarti's recipe to suit my taste and I'll try to call those out below. If you'd like to follow her recipe exactly, here's the link: Sloppy Bombay Joes. Heat oil in medium sauce pan on medium heat. Add ginger, garlic, and pepper. Saute until lightly brown, which will be almost immediate. Add garam masala and paprika and saute for 30 more seconds. Stir in tomato sauce and water. Bring to a boil, then reduce heat and simmer uncovered until thickened, about 15 minutes. In large skillet heat oil over medium heat. Add pistachios and raisins and cook until raisins plump up and pistachios toast, this will happen quickly. (I've never seen raisins do this before and it's kind of cool!) Remove raisins and pistachios from pan, place in bowl and set aside. Add ground beef and cook for about 5 minutes or so, breaking up the large chunks. Pour tomato sauce into skillet with meat and stir together, bring to a boil then reduce and simmer for about 10 minutes until meat is fully cooked. Remove serrano pepper and discard. Add honey, cream, pistachios and raisins and stir until mixed. Spoon over toasted bun and garnish with fresh cilantro.